Dr. Christina Yoon is a board certified pulmonologist based in San Francisco, California. She graduated from the Tulane University School of Medicine and did her residency in internal medicine at the NYU School of Medicine. She also did her fellowship in pulmonary disease and critical care medicine at the UCSF. She is specialized in the treatment of asbestosis, lung cancer, pleural mesothelioma, and pleural effusions. 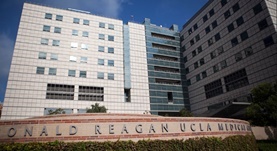 Currently, Dr. Yoon is affiliated with the Ronal Reagan UCLA Medical Center. She has also contributed to several research publications. Dr. Christina Yoon has contributed to 3 publications. Blood transcriptional biomarkers for active TB among US patients: A case-control study with systematic cross-classifier evaluation. Walter, N. D.,Miller, M. A.,Vasquez, J.,Weiner, M.,Chapman, A.,Engle, M.,Higgins, M.,Quinones, A. M.,Roselli, V.,Canono, E.,Yoon, C.,Cattamanchi, A.,Davis, J. L.,Phang...; J. Clin. Microbiol.. 2015 Nov 20. Point-of-Care C-Reactive Protein Testing to Facilitate Implementation of Isoniazid Preventive Therapy for People Living with HIV. Yoon, C.,Davis, J. L.,Huang, L.,Muzoora, C.,Byakwaga, H.,Scibetta, C.,Bangsberg, D. R.,Nahid, P.,Semitala, F. C.,Hunt, P. W.,Martin, J. N.,Cattamanchi, A.; J. Acquir. Immune Defic. Syndr.. 2013 Dec 19. Absence of peripheral blood chimerism in graft-vs-host disease following orthotopic liver transplantation: case report and review of the literature. Schulman, J. M.,Yoon, C.,Schwarz, J.,Vagefi, P. A.,Mully, T. W.,Shinkai, K.; Int. J. Dermatol.. 2014 Jan 01.